1.1 Fark looks weird on my computer. 1.2 Fark Mobile looks really weird on my device - what do I do? 1.3 My firewall is registering hits from Fark. What's happening? 1.4 What platform do you run all this on? 1.5 Is Fark reachable via IPv6? 1.6 Recent browsers are warning about pages not using HTTPS (SSL). When is Fark going to turn SSL on? 1.8 I get "You need to enter a comment!" when attempting to post comments. 1.9 Comment quoting and voting doesn't work reliably for me. Fark looks weird on my computer. First, try temporarily disabling ALL your extensions/plug-ins to see if the problem goes away. Many of the issues reported to us via Farkback end up being related to glitches from (sometimes outdated) extensions. If you are having problems with images or style sheets not loading, try clearing your browser cache first. Go to your Firefox Preferences: on most platforms this is under Tools -> Options, or on macOS, it's under Firefox -> Preferences. Find the Content button, look for the "Load Images Automatically" option, and click the "Exceptions..." button to the right of it. Remove any entries in the list containing fark.com or fark.net. On a normal Firefox install, the entire list is blank/empty. Before reporting any cosmetic issues via Farkback, look here to see a screenshot of what Fark is supposed to look like. Anyone using a current browser on a screen at least 1024 pixels wide (even 9" netbooks have screens that wide) should be seeing something reasonably close to that screenshot. Only browsers and operating systems that are new enough to support TLS 1.1 encryption are supported. Any browser new enough for that is, conveniently, also new enough to render modern HTML and CSS correctly. Windows XP and Vista are NOT supported. You MIGHT be able to make it work if you use Firefox 52 but even that isn't supported by Mozilla after Summer 2018. Android 4 (Jelly Bean, KitKat) is NOT supported. You MIGHT be able to make it work if you use Chrome 22 or later but this is NOT guaranteed. Internet Explorer 9 and 10 MAY work IF you are on at least Windows 7 AND you manually enable TLS 1.1 in its preferences; it's disabled by default. But you really should use something else if possible. We expect to cut off support for TLS 1.0 in mid 2018. Fark Mobile looks really weird on my device - what do I do? If you're on a supported device, and things still look strange, check your settings. For example, Blackberry has a setting to view a page in either Page View or Column View. 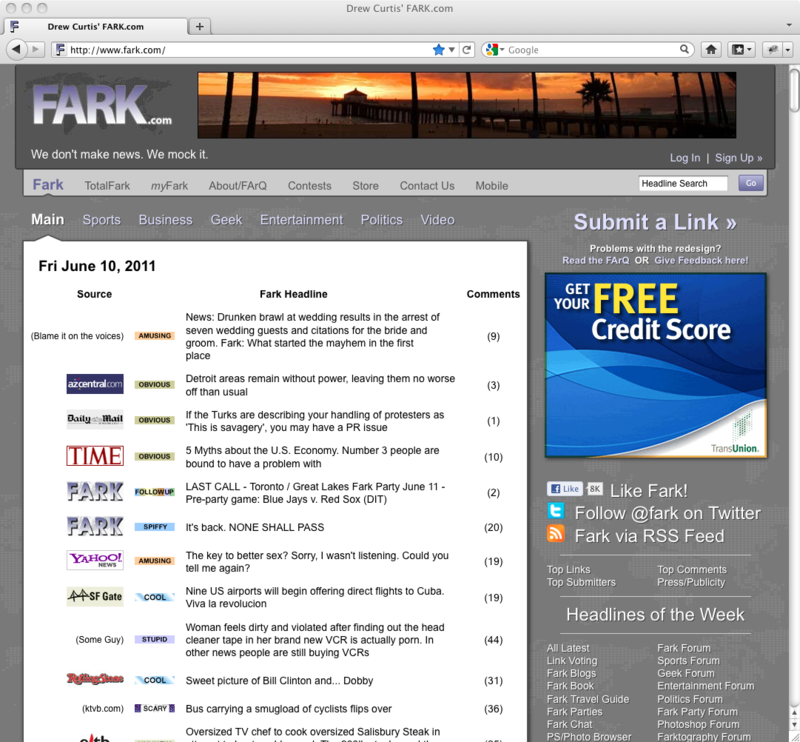 Fark Mobile must be viewed with Page View to be seen correctly. Windows Mobile has settings for 'One column', 'Full Page', and 'Fit to Screen'. For Fark Mobile to be viewed correctly, choose 'Fit to Screen'. If things still look strange, please take a screenshot (or just take a photo with a digital camera), post it somewhere, and send us a Farkback with a link to the image. My firewall is registering hits from Fark. What's happening? Usually this question is about people's firewalls registering "attacks" from img.fark.com when there aren't any. The actual issue is that your firewall's timeout for idle TCP connections is too short. Specifically, it's shorter than the HTTP Keepalive timeout. When a web browser connects to a web server and pulls a page, image, or other file down, it can keep the connection open for a few seconds/minutes. This speeds things up if the browser has to get another file from the same webserver -- which is almost guaranteed when you have a webpage with a bunch of images on it -- because it doesn't have to disconnect and reconnect for every single image. But it can't leave it open forever, either, so after a certain number of minutes (or seconds) the server or the browser will close the connection. Firewalls work by (I'm oversimplifying here) blocking all incoming traffic except what's specifically allowed. Any outgoing connections have to be monitored so that a temporary hole for the return traffic can pass back through. If a connection being monitored goes completely inactive -- like say your computer got powered off while you were downloading a large file -- it doesn't want to leave that hole open forever. So after a certain number of minutes, it removes the connection from its list of what it was monitoring. If the web server/browser gives up before the firewall gives up, everything's cool, but if the firewall gives up first, then it'll forget about the connection the web server/browser had, and when they get around to closing down, the firewall logs it as an attack (usually a FIN scan) when it really isn't. Otherwise check the settings on your firewall. On Cisco PIX and ASA 7.x and 6.x for example, look at the "timeout conn" command. On Cisco's IOS firewall, look at "ip inspect tcp idle-time". (And "ip inspect dns-timeout".) It might also help to get the latest version of your firewall software -- Sonicwalls in particular used to be excessively paranoid about this sort of thing and getting the latest firmware from Sonicwall helps cut down on the false alarms. Anyway, to work around paranoid firewalls like this, we've set our web server's keepalive timeout unusually short, and the complaints about this issue have largely disappeared. What platform do you run all this on? In case of problems, we have an outage page that's hosted on DigitalOcean's cloud service. Is Fark reachable via IPv6? Yes, since World IPv6 Day on June 6, 2011. Recent browsers are warning about pages not using HTTPS (SSL). When is Fark going to turn SSL on? We didn't earlier due to many ad networks not supporting SSL until recently. BareFark disables ads, so it also enabled SSL. But now SSL is always enabled for everyone. We send a lot of traffic to other sites, obviously. It's generally a good courtesy to let those sites know where the traffic comes from, so they know who to thank (or blame). Usually, that's accomplished by your web browser sending a "Referrer:" header to the target site, letting them know where the click originated from. We recently discovered that some browsers won't send that if you click from a secure site (SSL) to a standard, non-secure (unencrypted) site, and that hoses the stats pretty badly. This is by design in the HTTP specification (section 15.1.3 in RFC 2616). Sometimes it's also omitted when going from a non-secure to a secure site, as well. Fark was not an SSL-only website until March 2018, and we don't want to lose other sites' ability to tell who's sending them traffic. Also, if we share a link on a social media site (Facebook, Twitter, etc), the referrer tends to indicate that social media site instead of us. I get "You need to enter a comment!" when attempting to post comments. This started happening to some people running NoScript on Firefox, around May/June 2014. The problem seems more likely to happen when the comment you're posting contains images. In fall 2016, this also started happening to AdBlock Plus users. This ought to stop happening as of March 1, 2018, due to us switching to SSL for all pages. See the answer to the next question also. Comment quoting and voting doesn't work reliably for me. If you're using the Pale Moon browser, an update to it in November 2016 may have caused similar issues. In that case, the solution is to switch it from Gecko compatibility mode to Firefox compatibility mode (under Tools/Options/Advanced). See the answer to the previous question also. If you're using Chrome autofill for your passwords, and you change your password, it doesn't like to listen. Even if you clear out the field and retype your password, Chrome will often replace your typed password with your old saved password and it'll fail every time. To fix this, you have to delete the Fark entry from Chrome's managed passwords. See this Chrome help page and look under "Delete saved passwords" for more detailed instructions. Please Contact Farkback if you're not using Chrome autofill, or if you're still having problems.